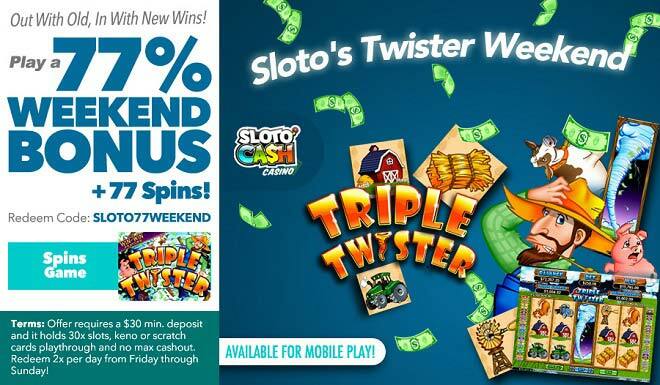 Spring Cleaning With Mr. Sloto’s Twister Weekend Bonus + 77 Free Spins! Spring is almost gone - which means you've still got time to freshen up your winning chances as the warm weather rolls in. Ahh! Isn't it a nice feeling? Deposit as little as $30 and you'll be out with the old and in with new wins with a 77% Weekend Match + 77 Spins! Spin the reels of Triple Twister with farmhouse allusive icons like the Farmer, the Farmer's Wife, the Cow, the Pig, the Dog, a Windmill, the Barn, the Tractor, the Bucket, the Haystack, the Weather Vane and the Twister icon! Get ready for the warm weather ahead by cleaning out the old and welcoming the weekends of June with a new winning attitude and Mr. Sloto's 77% Weekend Bonus + 77 Spins! Offer requires a $30 min. deposit and it holds 30x slots, keno or scratch cards playthrough and no max cashout. Redeem 2x per day from Friday through Sunday!